When I get the urge to bake, it's often unplanned, so I just look around the kitchen and to see what I can add to the recipe. This recipe ended up being a little bit of everything. I planned to use almond flour and coconut flour, but then realized I only had 3/4 cup of almond flour left, so I threw large flaked oats in as well to make up the rest of the flour portion. I'd never baked with pomegranate seeds before, but I kind of expected them to explode open like a cranberry or a blueberry. Out of curiosity (is it actually a seed? maybe it's a berry? ), I looked up the parts of a pomegranate. It is a berry containing many seeds, the fleshy red part is called an aril, and the crunchy part inside is the seed. The more you know, right? Anyway, they didn't burst open, they stayed in their crunchy, seedy form, which gave them a Christmas-y look. 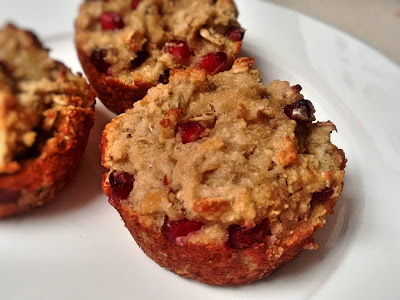 I think these muffins would be a perfect snack for Christmas morning! I don't require gluten free foods myself, but I like to bake gluten free snacks because the combination of almond and coconut flours is just so tasty. Those flours also add fat to the recipe, which means you don't have to add a lot of oil, and you will still have a moist muffin. Simon's favourite cake that I make is Almond Orange Cake, so I expected him to love these too. He said the muffin part was really good, but he couldn't get past the pomegranates in it. I had no idea he didn't like pomegranates until yesterday. I'll have to try this recipe with a different berry in them next time. Preheat oven to 325°F. Grease a muffin tin with canola oil spray. In a large bowl, combine almond flour, oats, coconut flour, salt, baking soda and baking powder. Mix until uniform. In a second bowl, combine mashed bananas, maple syrup, vanilla extract, coconut oil and lemon juice. Mash together well with a fork. Whisk eggs until frothy, then add to the mashed banana mixture. Pour wet ingredients into the dry ingredients and mix. Fold in pomegranate seeds. Scoop even amounts of batter into muffin tin. Bake for 18 minutes, or until muffin tops are lightly browned. Allow to cool for 3 to 5 minutes in muffin tin, then carefully remove (gluten free muffins can be crumbly before they cool), and place on a cooling rack.